Online shoppers do their homework before making purchases. To be more specific, 70% of all online American shoppers do research before making a purchase. A successful ecommerce marketing strategy takes that into consideration. Successful eCommerce marketing takes this trend into account, and instead of seeing it as a drawback, utilizes the right eCommerce apps to grow the business with lead generation. WholesaleBeddings.com, an eCommerce site that was a major player in the B2B realm understood that there was potential selling to end users too. To do so, they also knew that they needed to have the right eCommerce marketing plan to generate massive sales. This is exactly where Coupon Pop stepped in to generate more leads and sales. WholesaleBeddings.com is an eCommerce business specialized in selling home goods at deep discounts that can reach up to 80% off retail market values. The company started off as a direct importer and distributer of home textiles, with their main channels of distribution being department stores, online retailers, catalogs, and brick & mortar stores. Then, in 2009, they launched WholesaleBeddings to end users (consumers like you and I). Today we’re just into 2016 and they’ve been able to leverage their online presence so that 80% of the company’s revenue comes from selling to consumers (end user), whereas just a couple of years ago their B2B side of the business was making up the large majority of sales. If you were wondering, they haven’t lost any B2B sales; WholesaleBeddings has simply perfected their eCommerce marketing to include the use of high-quality on-site promotions in order to make their B2C side of business grow exponentially. The team behind WholsaleBeddings understood the simple concept that we started this post with: people tend to not make a purchase upon their first introduction to the product. To get over that bump in the road they added the Coupon Pop. 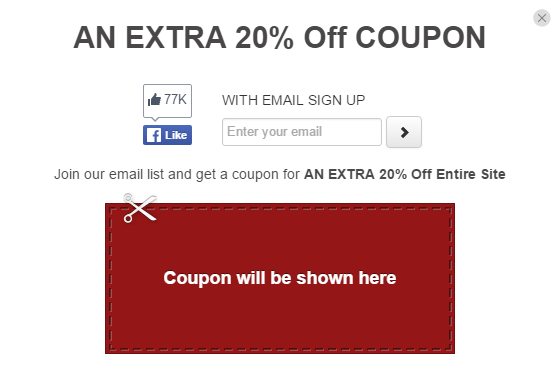 Below you can see that they did not recreate internet marketing with their offer (20% off) or popup design. They’ve wisely created the popup to enable anyone to either follow them on Facebook or join their email list. This leaves us with not too many options, and not too few. “The larger email list you have, the greater potential for increasing your sales”. It’s simple mathematics, and puts you, the business owner, in the driver’s seat. Angelus Direct was able to convert their gained leads from Coupon Pop into $40,000 in sales. The ability to do that too is in your hands! For WholsaleBeddings.com, the choice to use Coupon Pop, looking back, was one of the best eCommerce marketing decisions; their experience with coupon pop has been great! Aside from the simplicity (no coding!) that comes with using the tool, the results were better than they could have expected. After just a few months they’d collected 40,000 emails, and over 500 new Facebook fans! Aside from seeing that popups, Coupon Pop specifically, are an essential part of eCommerce marketing, there are a few other lessons that you should walk away with after taking a look at this web store. Contact/Customer Service: Before taking any action on the site, you’ll clearly notice two ways to contact the seller. WholesaleBeddings makes contacting their team simple and welcoming. You can either chat, leave a message, or give them a call. Making the customer feel that he/she is dealing with caring people is an irreplaceable aspect of an authentic eCommerce business. Customer Reviews: Another way to create trust between your business and the customer, as well as effectively promote your products is via product reviews. WholesaleBeddings has got this down right; they show you stared ratings before you even get to the product page. Once on the product pages you’ll find no shortage of product reviews that are sure to increase conversion rates. Simplistic Shopping Experience: Sometimes eCommerce businesses try to create extraordinary shopping experiences by adding tons of different elements and aspects to their web store. That unfortunately can be a conversion rate killer, and be a turnoff for people that just want to buy something. WholesaleBeddings get an A+ for the shopping experience. Aside from reviews and easy access to the company’s team, you get clear product images, easily compare the different products, displays pricing savings (creates a sense of urgency, which is a stellar eCommerce marketing strategy), and customer-friendly product descriptions. Going from a B2B business to being both a B2B and B2C outlet is no simple task. Those two types of buyers – business and consumers – are two very different groups with very different needs. It’s easier said than done for a traditional wholesaler to convert its revenues from selling to stores and large ‘big box’ merchants into selling to end users, but with the assistance of our on-site popup, they’ve done just that. Isn’t it about time your business started generating more online sales? There’s even a 14-day free trial. Not convinced? Here are just a few more success stories. Enjoy! Email Marketing for eCommerce: How a Diet Company Gained Over 30000 Emails: In just three months they gathered an insane 30,000 targeted emails to add to their email list! How to Increase Your Email List by 40% Using Pop Ups [Case study]: People were so attracted to their pop up (and of course the offer) that over the course of six months Tiger Mist grew its email list by 40% . How Raw Generation Used Urgency to Get Instant Sales: boosted its sales by +$28,000 and generated nearly 2,000 email addresses in just three weeks.